White Ghost Ranch is known for raising beautiful Whitetail deer for both sport and sale. 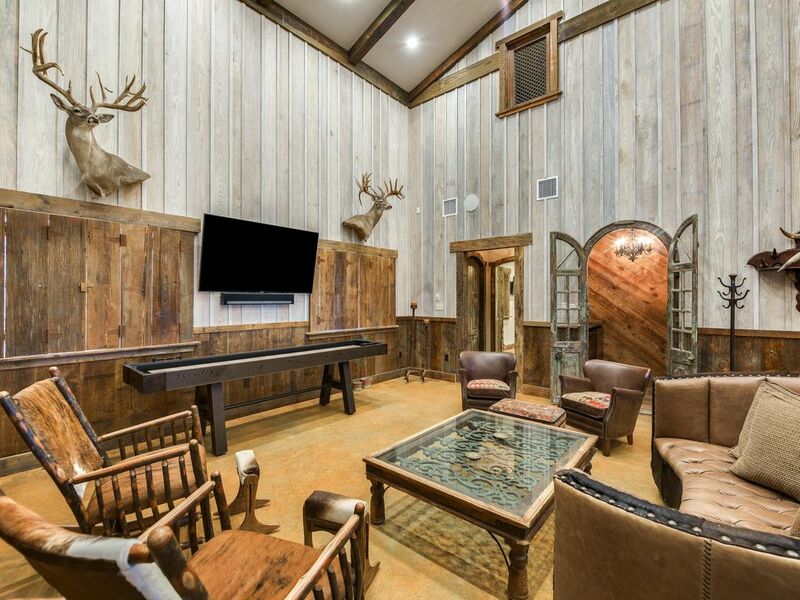 In past years, this exclusive property has only been open to hunters and personal friends. The owners expanded the original White Ghost Cabin property in 2017 and are now offering the public the opportunity to stay at this Hill Country paradise. Whether you are visiting the area for family fun, seasonal recreation or a business escape, this secluded and expansive property has so much to offer for your group. *This listing only includes bedrooms located in the new expansion, White Ghost Lodge. When you are looking at a photo of the property from the front, White Ghost Lodge is located on the left while the original cabin (White Ghost Cabin) is located on the right. The two are connected by the covered porch area with hot tub, pool table, dining area, fireplace, outdoor kitchen and bathroom. This outdoor area is considered common space. To see a listing for just White Ghost Cabin (a 2 bedroom, 1 bath that sleeps 6) search for listing number #1222844. This beautiful Lodge boasts all new construction with top of the line finishes, amenities and furnishings. Downstairs you will find a gorgeous custom kitchen with dining for up to 12, a grand living room with television, bar area and shuffleboard table, and 2 king bedrooms. Each of these bedrooms have their own television, walk-In closet, vanity and toilet, and they share a walk-in shower with rain water shower head. An additional king bedroom and bunk bedroom with pull out sofa are located upstairs. Each of these bedrooms has their own television, walk-in closet and vanity, and they share a toilet and walk-in shower with rain water shower head. The outdoor area has a fireplace, kitchen with grill and sink, dining for up to 12, a sitting area with television, hot tub, pool table and bathroom with toilet and sink. Apart from amenities at the home, you can also enjoy some amenities around the property as well. Wildlife tours, whitetail deer tours, bird watching tours, hunting and fishing in a trophy bass lake are all available seasonally for an additional price. These excursions need to be arranged well in advance in order to allow for accommodations to be made. For a small fee there is a shuttle service that can pick you up and take you around to some wonderful wineries in Fredericksburg and the surrounding area. We are here to help make your vacation a pleasant experience. We have been married for 25 years. We have two sons, 19 and 22 years old. The ranch has been a passion of Brent's since he was a young boy. Hard work and the love of people has given us the opportunity to give back with our time and resources to so many; our passion is terminally ill children. This property is in the beautiful rural community of Doss, Texas. You are in nature with animals; so expect some critters from time to time, as this is in the wild. Stargazing at the beautiful starry skies is a must. For an extra fee you will have the opportunity to bird watching, fishing in a trophy bass lake, hunting and a personal and up close tour of the ranch . Upscale accommodations... quite and peaceful! Our group of 5 adults really enjoyed our stay at this ranch! We were doing lots of activities all weekend in Fredericksburg so I wasn't sure about the 30 minute drive into town. First off, the drive is incredibly beautiful... exactly what you expect from the Hill Country in the spring. Plus, Fredericksburg and the wineries can get quite crowded and busy. This ranch was a perfect retreat from the hustle and bustle. The decor is rustic, yet very upscale. I would for sure stay here again. Beautiful ranch home in a magnificent hill country setting. We had a wonderful stay at the White Ghost Ranch - it was my family’s first Christmas after my father passed away and it ended up being the perfect setting. The house was extremely clean, well stocked with everything we needed, there was a surplus of amenities and the hosts were very nice and responsive. The beds were comfortable and the architecture is magnificent. All the Christmas decorations and other little touches just put everything over the top. We will definitely plan to stay at this property again for our next small holiday get together! Thank you so much for your kind review. We are very happy that we could make your stay with us a success. Many blessings to you and your family. The property is incredible. Booked it for a guys trip and everyone came back raving. The even suggested the opportunity to return with the ladies👌🏽. Guess it also gives off romantic vibes. Would definitely recommend and book again! Hi Marilyn, I just saw your review and I definitely appreciate you taking the time to do so. I'm glad to hear the guys enjoyed their visit with us. I knew they would :) Hope you girls get to come with them next time! Relaxing and enjoyable weekend getaway at this beautiful, spacious, and Incredibly clean property for our group of 7. Pam was quick to reply to any pre trip questions We had, and she and Bree welcomed us with a Texas hug on our arrival. Such a gem to find on Homeaway/VRBO, we plan to return soon. Worth every minute away from town! Home was great. Super clean and great in every way to entertain a big family. We had two families there and still had a whole mini house left to occupy. Outdoor patio, Sonos, pool table, and hot tub was all perfect. Thank you for your review of White Ghost Ranch. We are glad you enjoyed your stay and all of our amenities. We hope to get the opportunity to host you again! Beautiful property and lots of fun things for the entire family! Our overall experience was exceptional. Brent and Pam are very kind, helpful and went above and beyond to make our stay relaxing, fun and memorable. We had a total of 11 guests and 5 were children who had an amazing time. The lodge is beautifully decorated with all the amenities you need. Comfortable King size beds, spacious rooms and closet space. The property offers fishing, a pool table, shuffle board, bean bag toss, and a hot tub! The deer are beautiful and could be seen every morning right outside the lodge. Our kids even got to experience watching the deer being vaccinated. I cannot say enough great things about Brent and Pam! Thanks for making our stay a memorable and great experience for everyone. Thank you for choosing White Ghost Ranch. Your review is very kind. We are thrilled we made your stay relaxing, fun and memorable for you and your family. We hope to get the opportunity to host you again in the future!